2005 : A new step is taken in the diversification strategy followed by LOUIS DREYFUS ARMATEURS with the creation of LD Lines and the purchase of a ferry boat, Norman Spirit. Thanks to this new subsidiary, the group engages in passenger and vehicle transportation on regular lines across the Channel. 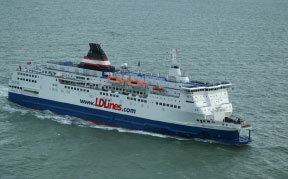 The Dieppe-Newhaven line is operated by LD Transmanche Ferries, a sister company of LD Lines.This same year, purchase of the company Nicolas Frères, which specializes in stevedoring port services at Fos-sur-Mer (France). 2006 : Fret-CETAM launched the construction of two additionnal ro-ro vessels dedicated to the transportation of A380 components: City of Hamburg and Ciudad de Cadiz, built in Singapore by ST Marine shipyard and delivered in 2008 and 2009. 2007 : Philippe Louis-Dreyfus and his children bought out the LD Group’s maritime branch, thus becoming independent from the Louis Dreyfus Group. 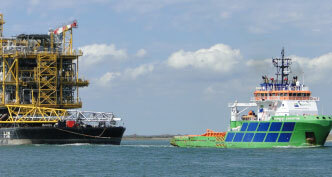 The same year Louis Dreyfus Armateurs acquires Fairmount Marine BV, the worldwide specialist of high sea towing. 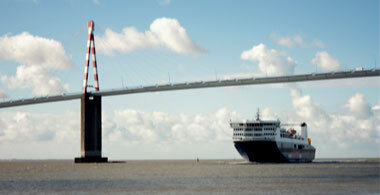 2008 : Arrival of the Norman Voyager, a new ferry boat destined to LD Lines allowing an increase in the rotations between France and Great Britain. 2009 : The specialized port services activity is reinforced through the creation of a joint-venture with the Indian company ABG Infralogistics. This common company named ABG-LDA Bulk Handling (ABG-LDA) ambitions to become the leader in dry bulk handling in India; a country where dry bulk imports and exports (coal, ore, cement, fertilizers…) are steadily growing. The Port de Cherbourg SAS company is set up and would handle the port’s management through a public service delegation. 2010 : The LOUIS DREYFUS ARMATEURS Group furthers its development in the “motorways of the sea” project. That year came into service the first motorway of the sea between France and Spain, and operated by GLD Atlantique. The line is then serviced by the Norman Bridge, à RoPax vessel with a capacity of 120 trucks or 150 trailers and a 399 passenger capacity.